The Somerset Patriots, including pitcher Will Oliver, will begin their quest to win the Atlantic League Championship series at home on September 30th. Oliver, the Frontier League pitcher who was ruled ineligible after much controversy surrounding his age, has settled in nicely with the Patriots in the Atlantic League. After causing his former team the Evansville Otters to forfeit ten games due to his ineligibility, Oliver quietly went to Somerset to continue playing the rest of the season in a league that doesn’t have age restrictions. While not as dominating as he was in the Frontier League (his stats for 13 games with the Otters included a 9-2 record and 1.59 ERA), he has still continued his winning ways with the Patriots. Since joining the team at the beginning of August, he has a 6-2 record with a 3.17 ERA in nine starts during the regular season. Those are great stats considering the amount of pressure and stress that he’s been through this season; However, his playoff appearance this past weekend was where he really shined. 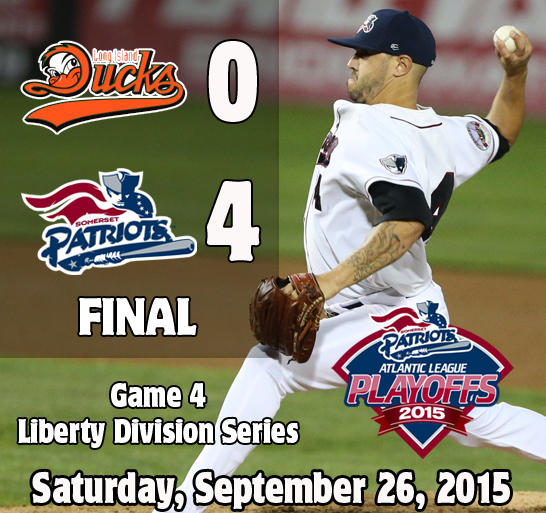 The next day, Patriots pitcher Roy Merritt followed Oliver’s performance with a complete game shutout of his own, leading the Somerset Patriots to the Liberty Division Championship. The Atlantic League Championship Series between the Somerset Patriots and the Southern Maryland Blue Crabs begins September 30th at TD Bank Ballpark in Bridgewater, New Jersey, home of the Patriots.